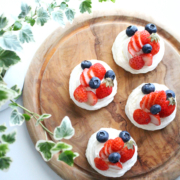 Pavlova is a meringue based dessert, popular in Australia and New Zealand. I thought it was a Russian dessert because of the name, but it is named after a Russian ballerina. It’s not known well in Japan. I first tried it when I lived in Dubai. I thought Pavlova was too sweet for me but it wasn’t. The Pavlova I tried was served with whipped cream and tart berry sauce. The outside of the meringue was crispy and the inside was soft. I fell in love with this dessert. Most Japanese people don’t like really sweet sweets so I changed the whipped cream to a less sweeter version of it by adding cream cheese. 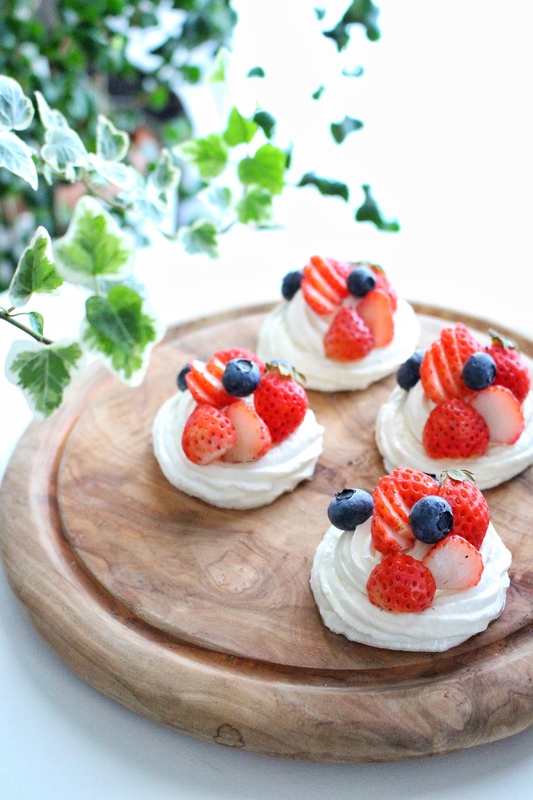 In addition, I love the combination of cream cheese and berries! 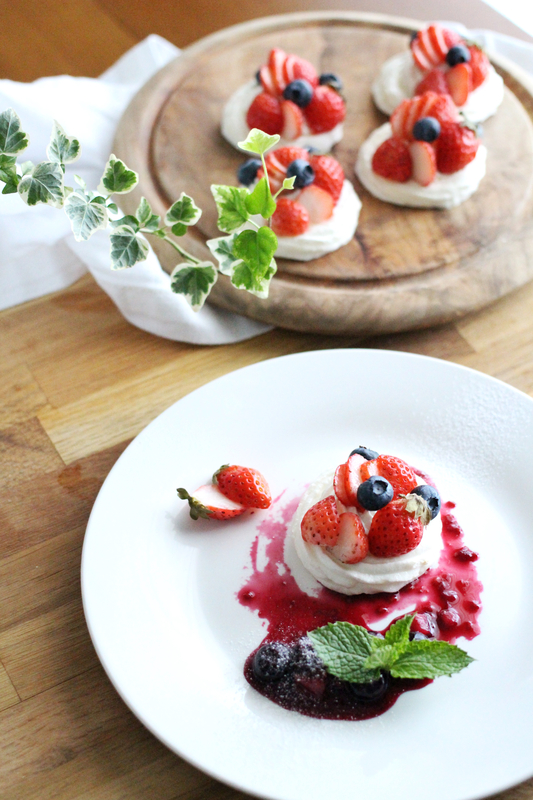 I made an individual small pavlova, but you can bake one big pavlova for sharing. Preheat the oven to 110℃/230℉. Line a large baking tray with baking paper. Whip the egg whites and sugar. First, add one pinch of sugar into the egg whites and start whipping. When it begins to form, add half of the sugar from the container and keep whisking. When it forms a stiff peak, add the rest of the sugar and keep whipping. Add lemon juice, corn flour, vanilla extract and fold it gently from below to above. Pipe the meringue onto the baking paper using a star tip. Bake it in the preheated oven at 110℃/230℉ for 60-70 min. Make the cheese cream. Combine the cream cheese and the sugar, add whipped cream and mix it. Make the berry sauce. Put the mixed berries in a small pan, add the sugar and cook it for about 5 minutes. Mix occasionally. Remove it from the heat and add the lemon juice. Let it cool. Pipe the cheese cream into the meringue, arrange with fresh berries. Serve it on a plate with the berry sauce. If you use fresh berries, add a few tablespoons of water before cooking. You can add more sugar if you like. If you make it when it’s humid, it’s better to it eat as soon as possible. The meringue will get moist and sticky.